As seen in the May 2019 issue of Model Aviation. Two days of flying. Thousands of spectators. One goal: To raise $40,000 to benefit the Just for Kids Transport Team at Norton Children’s Hospital in Louisville, Kentucky. That amount and more is exactly what the River City Radio Controllers club in Louisville raised. The Wings for Kids Radio Controlled AirShow took place June 2-3, 2018, at Bill Fluke Field in E.P. "Tom" Sawyer State Park and has been held for the past 18 years. Each year, the 150-member club sets a higher donation goal than the previous goal to raise money for the hospital, which operates ambulances, helicopters, and an airplane to transport sick children across the US. The proceeds from this year’s event would help purchase an Isolette monitor for that transportation. According to Courtney Puckett, the development coordinator for the Children’s Hospital Foundation/Norton Healthcare Foundation, "In 2016 alone, the team transported nearly 650 infants, highlighting the magnitude of the need for this piece of equipment." Many top RC pilots from across the Midwest are invited to participate in the two-day event. They show up each year without hesitation to perform for the spectators who line a wooden fence dividing the flightline from the viewing area and bleachers. Those pilots have smiles on their faces, answer questions from onlookers, and have the best time showing off their flight skills. Every aspect of RC flying is included, from World War I biplanes, World War II warbirds, and civilian aircraft, to Giant Scale biplanes, 3D airplanes, helicopters, and turbine and EDF jets. There was even an RC Combat dogfight with airplanes trailing streamers behind them, as well as a flying lawnmower and flying Iron Man. Many activities are set up for air show visitors. The Air Methods Kentucky air medical transport helicopter flew in, allowing spectators a chance to peek inside and see it up close, and several transport ambulances were staged in viewing areas for walk-throughs. 01. Spectators line the fence behind the flightline to get a closer look at the airplanes. Many had a chance to talk with pilots and ask questions about the hobby and aircraft. 02. As noted on the top of this Piper Cub, Wings for Kids is "Just for Kids!" All proceeds from the two-day air show, as well as from the lunch tent and raffles, went to Norton Children’s Hospital. Even Holly, the new hospital therapy dog that was funded by the air show’s platinum sponsor, Independent Pilots Association, made an appearance, although she stayed in or under the Just for Kids ambulance out of the heat between times of being petted by kids! Children were also treated to a bounce house and activities such as drawing with chalk on blackboards, face painting, bubbles, crayon art, trying out flying skills on RC simulators in the AMA Model Aviation Mobile RC Experience trailer, and a candy drop from one of the air show airplanes. Many companies and individuals alike donated more than $13,000 in prizes to the huge raffle! Prizes not only came from the hobby industry, but also from local and national companies and individuals in the way of goods, gift certificates, and gift baskets filled to the brim with variously themed items. The raffle tent was busy throughout the day, with people hoping to win some of the great offerings. Johnnie Selby and John Boyko served as emcees for the event and not only gave history lessons about the different eras of full-scale aircraft that were flying, but provided information about the different types of model aircraft. They entertained the crowd with their quips back and forth to each other in between the sounds of motors and engines in the air. John told his own story of why the Wings for Kids air show was so important and significant to him (he also spent time as a patient in a children’s hospital). The heat and humidity of early June didn’t deter from the fun and giving of this event. By Sunday when the event ended, the River City Radio Controllers had surpassed its goal of $40,000 by raising $46,411, bringing the total donations in the history of the event to more than $300,000! Kids await the signal to run out onto the flightline to gather treats after candy was dropped from an airplane. The candy drop is an annual event at the air show and one that returning kids anticipate each year. Courtney stated that Norton Children’s Hospital and the Children’s Hospital Foundation were excited about the donation. "The Children’s Hospital Foundation is incredibly grateful to not only be the beneficiary of such a fun and exciting family event, but to also have the dedicated support of the River City Radio Controllers. 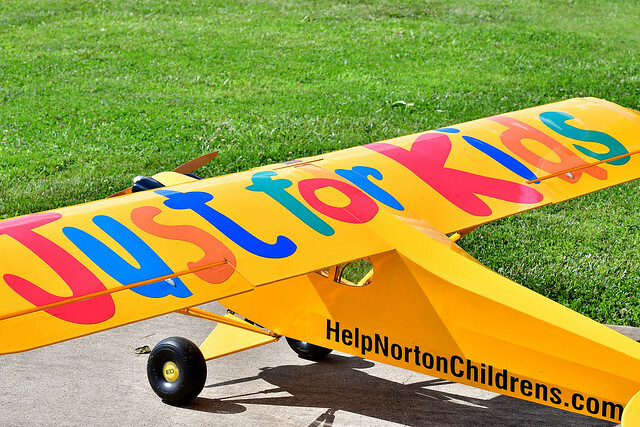 "The Wings for Kids AirShow benefits the Just for Kids Transport Team at Norton Children’s Hospital and has undoubtedly made an impact on the patients and families we serve. Thanks to Wings for Kids for helping make possible the [purchase] of this life-saving device [the Isolette monitor]!" "A big THANK YOU to everyone who helped to make our 18th annual Wings for Kids Radio Controlled model air show a huge success … that is an astounding accomplishment for a small 150-member club, but it really goes much deeper than that. Dozens of companies, individuals, and families generously donate their money, goods, services, and time to make this event a success. Norton Children’s Hospital, as the recipient of ALL proceeds, works very hard as a partner with the River City Radio Controllers to provide the resources and people necessary to put on a two-day event attended by thousands of spectators and dozens of participants. 03. Jim Neal’s 50% Christen Eagle wowed spectators as it performed loops and rolls—the same as what the full-scale aerobatic airplane would do. 04. Red Baron Stearmans fly again! Bob Belluomini and Mark Feist flew two of these biplanes in formation—complete with smoke. 05. 3D-style aerobatic airplanes hover on their tails over the runway during the air show. 06. Johnnie Selby (L) and John Boyko emceed the air show and used their knowledge of the hobby and aircraft to educate spectators about the history of the models’ full-scale counterparts, as well give specifications for the type of model aircraft that were taking flight. 07. Jerry Smith, a nine-time national fun-fly event champion, hovered, rolled, dipped, and dived, trying to catch the tail (ribbon) with the nose (propeller) of his aircraft. He entertained spectators several times throughout the air show with different aircraft, including playing a farmer who lost his flying lawnmower. 08. The full-scale medical transport helicopter for Norton Children’s Hospital was one of the attractions at the Wings for Kids air show. Spectators were allowed to get up close and talk with its pilots. "This is a big effort. Volunteers work hard for months to solicit donations, support, organize, and produce this event. Volunteers spend the week prior to the show preparing the airfield, cutting grass, putting up signs, putting up tents, setting up bleachers for seating, and picking up supplies and donations. "Top RC pilots from several states, along with local pilots, come in and bring spectacular aircraft to the show. During the show, dozens of volunteers work to cook, raffle prizes, manage parking, provide security, provide sound systems, video, photos, prepare activities for children, and make sure everyone has a great time. Norton Children’s Hospital brings in ambulances and lands [its] helicopter at the airfield so people can see firsthand what their donations provide. And when it’s over, tired but proud volunteers tear it all down and start planning for next year’s show. "All of our generous sponsors are the backbone of our success … And our many volunteers, largely unseen and behind the scenes, deserve a great big thank-you for all that you do. Now it is on to 2019 and the 19th annual Wings for Kids AirShow!" For the 2019 event, planned for June 1-2, the River City Radio Controllers and Wings for Kids hope to raise $50,000. There’s no doubt that they will surpass this goal, while providing entertainment in the way of flight.